Snow Storm Slams Midwest, Causes Thousands Of Flights To Be Canceled Blizzard conditions are being experienced from St. Louis to Chicago and into Wisconsin. The storm caused the first blizzard warning in Kansas City since 2011 and is set to hit New England this week. A plow clears snow from Road 438 in Douglas County near Lawrence, Kan., on Sunday. The area is under a blizzard warning. The storm will continue into northwest Missouri, northern Illinois and southeast Wisconsin before heading into New England, bringing dangerous blizzard conditions in its path, the NWS says. More than 1,270 flights nationwide were canceled on Sunday. Nearly 5,000 more have been delayed into Monday morning. Chicago's O'Hare airport, a hub for the entire Midwest, saw mass cancellations — 801 arriving and departing flights were canceled on Sunday, with more than 300 others delayed. However, Newsweek reports that it set a daily snowfall record of 5.3 inches in Kansas City, noting that the previous record of 3.9 inches was set in 1895. "The National Weather Service said Kansas City International Airport received 5.3 inches, but totals ranged across the region," reports member station KCUR. "The blizzard warning, which the NWS said was the first in Kansas City since Jan. 31, 2011, stretched south from the Missouri state line to Olathe, west to beyond Topeka and east to Macon, Missouri." The storm shut down 235 miles of Interstate 70 in Kansas for several hours on Sunday, as well as a portion of Interstate 29 from Mound City, Missouri, to the state's border with Iowa. By Sunday afternoon, Kansas Gov. Jeff Colyer declared a state of emergency. "We strongly recommend that you postpone travel plans," the Republican said in a statement, noting gusting winds and whiteout conditions. The Kansas Division of Emergency Management has received multiple reports of drivers abandoning vehicles stuck in the snow. "Road crews may not see you due to visibility issues. Stay in your vehicle," Colyer said. Other snow totals throughout the state are still being measured, the Kansas City Star reports. Preliminary data from the NWS says different parts of the state received between 2 to 12 inches of snow. Over 67,000 power outages occurred throughout Kansas thanks to powerful wind gusts of over 55 mph that knocked down power lines, with Atchison, Leavenworth and Ottawa the hardest-hit areas, according to KCUR. 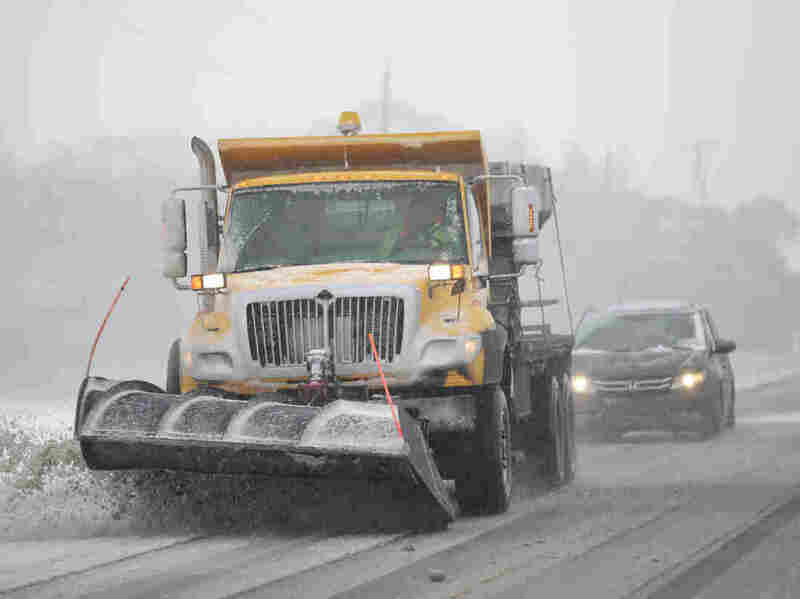 As the storm passed through Kansas on Sunday evening, the National Weather Service lifted blizzard warnings from the state and declared them in parts of northeast Missouri, including St. Louis, north Illinois, including Chicago, and southeast Wisconsin. The NWS projects the storm will shift northeast and dump heavy snow across the Great Lakes into New England through the first half of the week.